We're only two-thirds of the way through February 2019, but the pace at which distressed U.S. firms are announcing dividend cuts has picked up considerably. What is most different from January 2019, however, is the number of firms in the financial sector, where there is a surprising number of asset management firms announcing dividend cuts this month. At this point in time, we can confirm that the number of dividend cuts in our sampling for the first quarter of 2019 has surpassed the total recorded in the first quarter of 2018. Unlike what we saw in January 2019, however, the near-real time sources that we track for dividend cut announcements suggests that distress is spreading beyond the oil and gas sector of the economy. While firms in the oil and gas sector are still well represented, the overall number of these monthly variable dividend payers is so far more consistent with what we expect to see for these firms from month-to-month, which is a good sign following the deluge of dividend cuts announced by oil and gas industry firms in January 2019. What is most different from January 2019, however, is the number of firms in the financial sector, where there are a surprising number of asset management firms announcing dividend cuts this month. At the same time, we're seeing a growing number of industries being represented among dividend reducing firms, including technology, telecommunications, consumer goods, business services, healthcare, automotive manufacturing, aerospace manufacturing, and utilities. One from the food sector, Fresh Del Monte, isn't cutting its quarterly cash dividend of $0.15 per share, but it is suspending it, which is also an indication of distress. The following chart illustrates the cumulative number of dividend cuts in 2019-Q1 by day of the quarter, compared with what we recorded back in 2018-Q1. At this point in time, we can confirm that the number of dividend cuts in our sampling for the first quarter of 2019 has surpassed the total recorded in the first quarter of 2018. 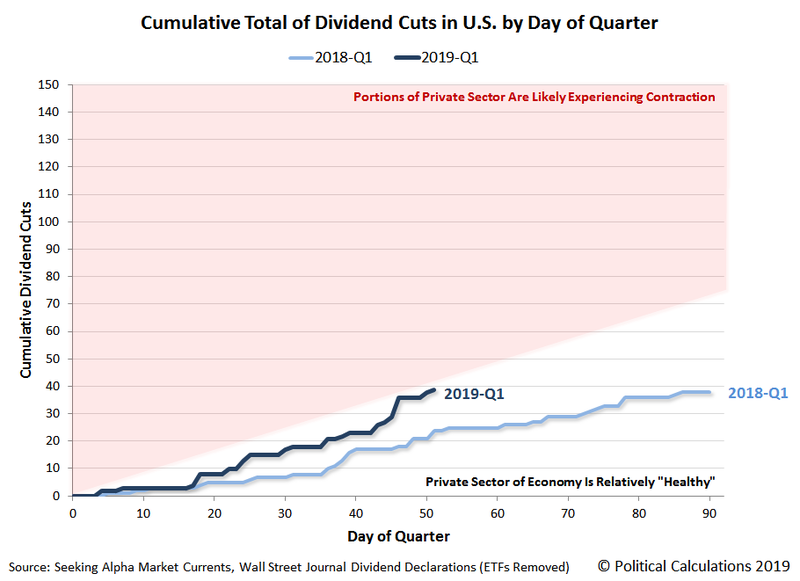 The pace at which dividend cuts are being announced is getting close to the threshold that would indicate that some degree of economic contraction is occurring within the U.S. economy, although, at present, it hasn't yet crossed into the red. Seeking Alpha Market Currents. Filtered for Dividends. [Online Database]. Accessed 20 February 2019. Wall Street Journal. Dividend Declarations. [Online Database]. Accessed 20 February 2019.